I'm waiting for the subway after a long day of work, content with staying the extra hours because I know tomorrow will be a milestone of my life. What better way to celebrate my first experience at a film festival than continuing my endless task of discussing every single Simpsons episode. So today we look at the day Springfield held it's own film festival. 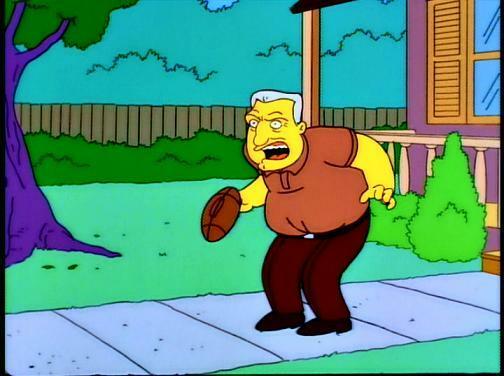 Alright time for some football in the groin. Couch Gag - the family runs in, but they are now backwards in size, with Maggie being an oversized baby, and Homer being a tiny man.....eh not my favorite. 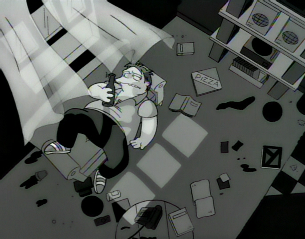 A Star is Burns was the crossover episode between The Simpson, and (at the time) new primetime cartoon The Critic. The Critic of course being the brainchild of some longstanding Simpsons alumni. The city attempts to bring respect to Springfield after ranking last in culture and science, and Marge suggests holding an amateur film festival. 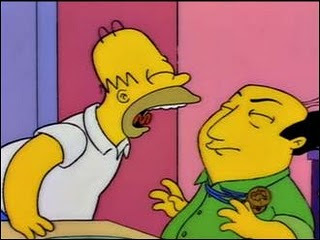 In searching for a guest judge, she finds Jay Sherman, but when he comes to Springfield, a rivalry between Sherman and Homer begin, as Homer begins to feel inadequate against Sherman's intellectual superiority. Often times the show lets Homer run amok with his stupidity without any clarity or revelation as to how ludicrous his acts of mischief really are. Here it is brought to his full attention how much of a man child he really is. Jay is in no way a mature adult, he is still egotistical and has a pompous air about him, yet these represent personality problems of an adult. Homer is a big child, and as stated in one episode "provides Marge with complete and utter dependence," yet like a child he is still lovable and incredibly sincere. These two ideals are at odds throughout the episode, so when Marge makes her choice out of guilt to place Homer on the judging committee, she gets upset when Homer continues to treat everything like a game. She even reaches the breaking point and calls Homer out on making a stupid(albeit hilarious) choice for football in the groin, forcing Homer to come to grips with his childlike mind and attempt to grow up and respect adult things like "art". Barney's film "Pukahontas" is the perfect representation of stuffy art films. It is a hilarious mockery of everything people think of when they think of "artsy" films. From being shot in black and white, to the overly serious narration, to the operatic music in the background. My favorite scene from Barney's film occurs at a girl scout meeting where Barney chastises the girls for not being able to admit they have a problem. This film against football in the groin, which could not be anymore childish, parallels the dichotomy between Homer and Jay. Surely there were more than two films at this film festival right? Well Apu created a film far ahead of his time, with his found footage piece using the video from the Kwik E Mart cameras. 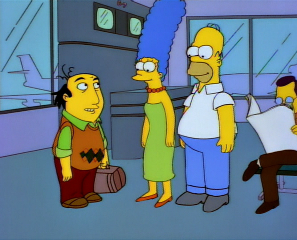 Moe returns to Hollywood infancy with his song and dance number, ultimately crumbling under his own ambition. 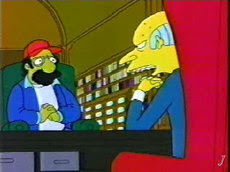 Then there's the film from Mr. Burns, directed by Spielberg's Mexican counterpart Senor Spielbergo. He takes bits and pieces from huge blockbusters and pieces them together in what is a symbol for the lifelessness present in big blockbusters. Even after paying homage to all these great films, Burns is left with an empty soul of a film. The bits with Burns putting his film together yields the most laughs for me. In fact anything with Senor Spielbergo just has me doubling over. From "Senor Burns?...el es el diablo"....to his assessment of Bumblebee Man's audition it's all gold. I like this episode a lot, but it exists in my head in bits and pieces. It's not the type of episode where reciting the whole episode just makes me laugh. I love the films the townspeople made, I love George C Scott at the end, I love the video they show for Springfield being last in the country for science scores. " You stole my soul" Always fun to revisit, and always good for some laughs. I know it's been awhile since I looked at this show(the greatest of all time), but rest assured I intend to fulfill my commitment. One last thought - Hans Moleman has another classic line....."I was saying booo urns"